Some nights you just feel like making something quick and easy for your family. This is what I make on those nights. 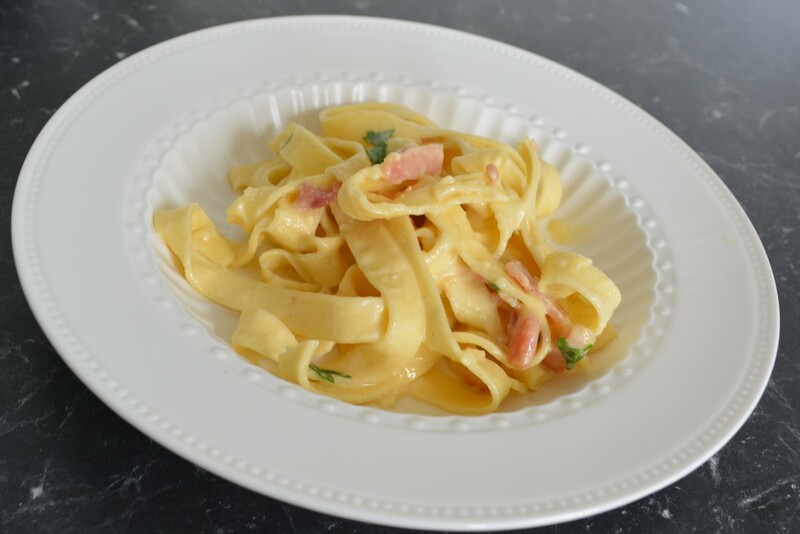 This is the second carbonara recipe on my site, but I had to add it, not because it is better than the other one, in fact I love both of them, but it just deserved to be here, as we loved it so much. 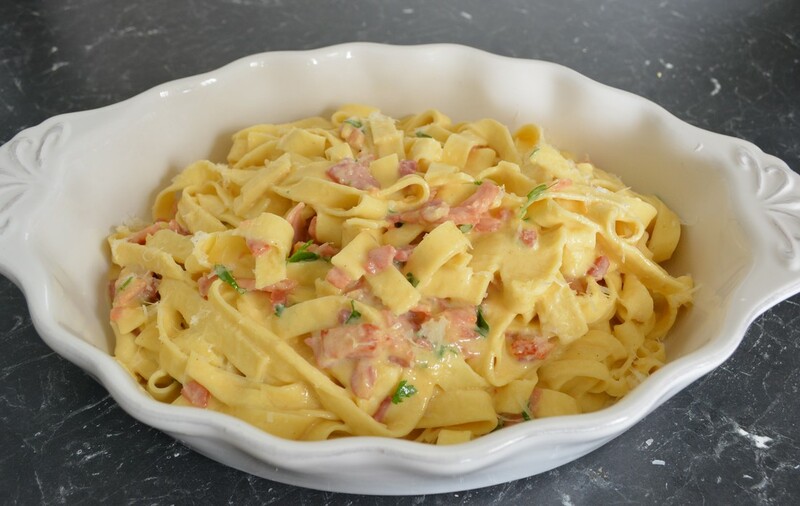 This one adds a bit of cream into the sauce which is not in a usual carbonara. My husband and youngest son were not supposed to be home for dinner, when I planned this. But last minute changes meant they were, I knew this would not be enough for us five as I only bought 250g pasta, so it was amusing watching my kids eating and watching the pan, making sure that they ate quick enough that they got a tiny bit extra. We all loved the pappardelle, it really is a lovely pasta. The recipe says 400g pasta, but you can use less, like I did, if cooking for 2 say, it will just be saucier if making it with less pasta. If you need more, just double the recipe. If you a short on time this is a brilliant mid week dinner, it is made in the time it takes to cook the pasta. Cook the pasta in a large saucepan of boiling salted water, following packet directions, until al dente. Meanwhile, heat the oil in a large frying pan or saucepan over medium heat. Add the bacon and cook for 4 minutes or until it starts to colour. Add the garlic, stir it through, cook for 30 seconds, turn off the heat. Place the eggs and cream in a bowl and whisk until well combined. Season with pepper. You may add a light sprinkle of salt, but the bacon and parmesan are salty, so don't add too much. Reserve 1/3 cup of the pasta water. Drain the pasta, then put the pasta back into the saucepan you cooked it in. Quickly while the pasta is still hot, add the bacon, egg mixture, parsley, 3/4 of the parmesan cheese and the reserved water. Toss the sauce through, the residual heat of the pasta will cook the eggs in the sauce. Sprinkle with the remaining parmesan and serve immediately.